Canada’s economy is heading for its worst non-recession showing in more than 50 years, Bank of Montreal warns. But while the first half of 2015 was ugly, the rest of the year should show a pickup, BMO Nesbitt Burns said in a new forecast today. We already know that the economy contracted at an annual pace of 0.6 per cent in the first three months of the year, and BMO now believes it shrank 1 per cent in the second quarter. 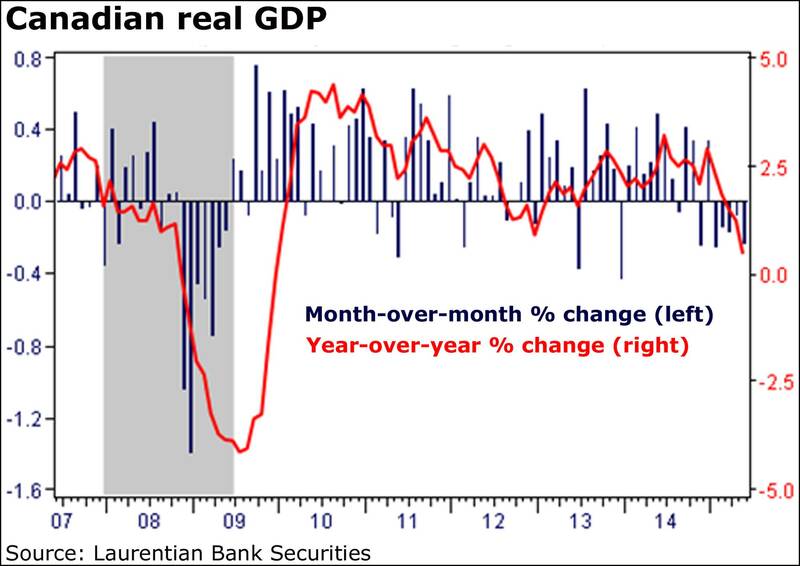 “The contraction has been persistent, pronounced (totalling 2 per cent annualized), and somewhat pervasive,” Mr. Guatieri said. “It was led by the goods-producing sector (-7.7 per cent) in general, and energy and mining industries, in particular,” he added. The BMO report is bleak where the first half of the year, and the oil provinces, are concerned. “Alberta, Newfoundland and Labrador, and possibly Saskatchewan, face recessions this year given their high resource exposure,” BMO said. Mr. Guatieri predicts economic growth will perk up to about 2.5 per cent in the second half of the year, but that would bring the year’s total to a measly 1.2 per cent. There are some bright spots: Exports showed a dramatic bounce in June, the oil shock will “at least abate,” and the government’s new child benefit tax scheme will put more money in the pockets of consumers. Housing markets are also strong, Mr. Guatieri said. The Bank of Canada has already cut its benchmark rate twice this year, and is counting on a loonie-sparked rebound in exports. Some economists speculate the central bank could cut further. But at the very least, it won’t be hiking rates any time soon. The ever-lower loonie should also help, according to several economists. “Currency movements can take up to three years to fully affect net exports, and the loonie’s 20-per-cent dive against the greenback in the past two years is the largest ever recorded in such a period,” Mr. Guatieri said. Indeed, some folks are knocking Canada’s long election campaign as an added cost to taxpayers, which it is, and for giving an edge to the ruling Conservatives, which it does. But there is a benefit, if small, in the 11-week run-up to the Oct. 19 vote: The country’s fragile economy can use any spending jolt it can get just about now. 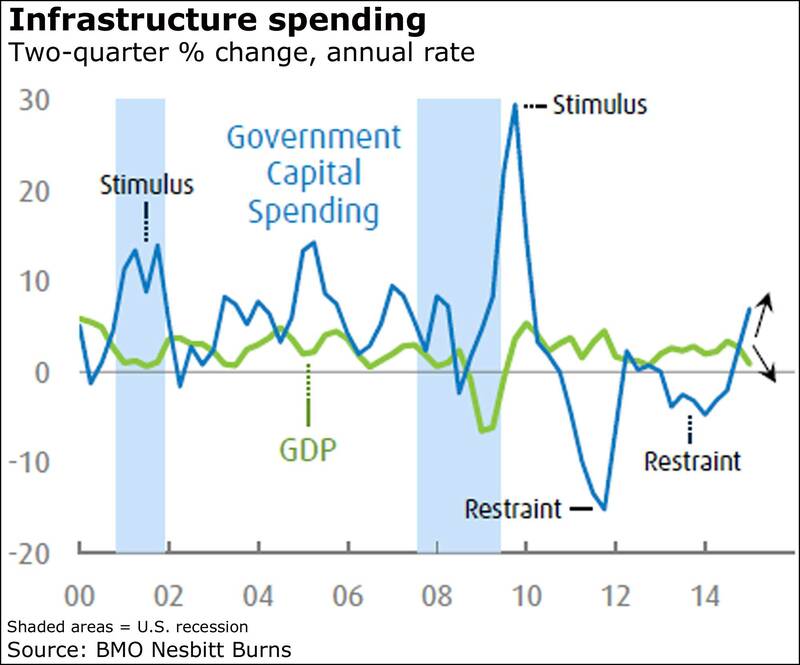 “Pre-election spending should provide a temporary boost in Q3 and Q4,” said chief economist Douglas Porter of BMO Nesbitt Burns. Remember, too, that some provincial governments are in restraint mode, hunkering down rather than gearing up. The Conservative government has already got a campaign jump with a series of spending announcements left, right and centre (geographically), while its new child care benefits scheme was expected to put some $3-billion into the pockets of consumers last month. “This will likely give at least a temporary lift to retail sales and overall consumer spending in Q3,” Mr. Porter said. And then there are the projects already announced. “Ottawa is busily trying to expedite some new infrastructure projects, although the latest flurry likely won’t see shovels hit the ground until next spring,” Mr. Porter said. “Still, government fixed-investment spending has risen at a 6.9-per-cent annual rate in the latest two quarters ... the fastest pace since the early stages of the recovery in 2009-10 and a rare bright spot for the overall economy,” he added, referring to such spending by all levels of government, not just Ottawa. The New Democrats and Liberals, of course, haven’t had the opportunity to fund projects, but they’ll be rolling out their pledges over the next 11 weeks that mark the third-longest campaign in Canadian history. Party platforms, of course, aren’t budgets, as CIBC World Markets chief economist Avery Shenfeld noted, and thus should be taken with a “grain of salt” as a guide. 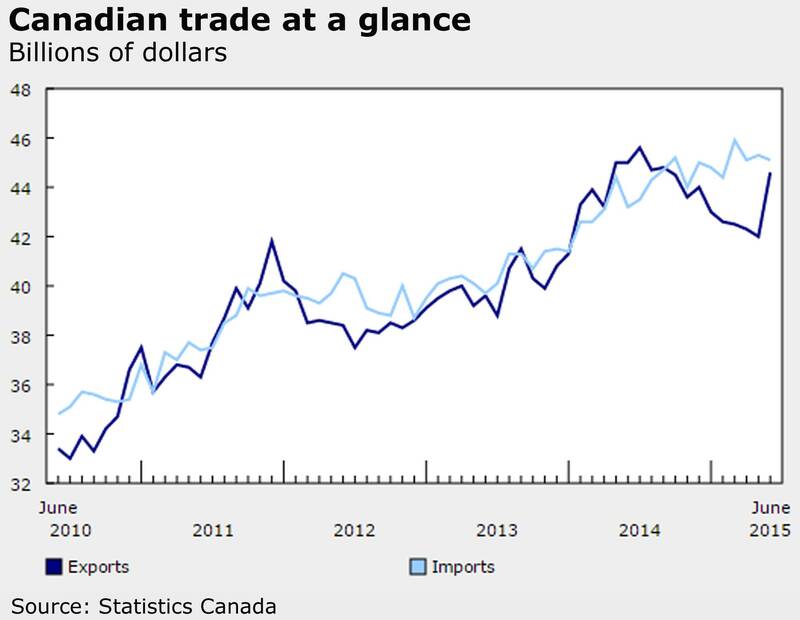 As Mr. Guatieri, noted, Canadian exports rebounded in June on the back of a surge in goods bound for the U.S., leading to a dramatic narrowing of the country’s trade deficit. Exports climbed 6.3 per cent, while imports slipped 0.6 per cent, shrinking the trade gap to just $476-million from the swollen $3.4-billion of a month earlier, Statistics Canada said today. Remember that the Bank of Canada said recently it was puzzled by the failure of exports to rebound, and that it and other observers have pinned their hopes on a pickup spurred by the weak loonie. Notably, export volumes climbed 4.8 per cent after five straight months in the red. Pharmaceutical and other medical goods rose 41.7 per cent, while prepared and packaged seafood products soared by almost 130 per cent. The sudden export turnaround was led by trade with the U.S., Canada’s biggest trading partner. Exports to the U.S. climbed 7.1 per cent, while American imports dipped 0.9 per cent, widening Canada’s surplus with the U.S. to $4.7-billion from May’s $2.1-billion. “After a deluge of negative readings on the Canadian data points, chalk one up for those looking for better days in the national economy,” CIBC World Markets economist Nick Exarhos said of the report. Conservative Party: You’ve got to promise on the family membership form that you’re not paying with a corporate credit card. That doesn’t mean you can’t be a CEO, just that you can’t bill the company. Options on the form run from $15 for a one-year membership to $60 for five years. Options for additional “tax-free deductible” contributions run from $25 to $500 and “other.” There is no request for information on how you identify, but I’m sure they’d love to know your net worth. Accepts Visa, MasterCard and Amex. New Democratic Party: You get to put your union’s name on the membership form. How much you pay depends on where you live (just $1 in Alberta), whether you’re 25 or under (just $1 in Alberta) and whether you un- or underemployed (just $1 in Alberta). It’s free in Newfoundland and Labrador, but still $10 if you’re jobless in Saskatchewan, New Brunswick or Nunavut. You can click a box if you identify as “one of the following equity seeking groups” like LGBT, First Nations or woman. Accepts Visa and MasterCard. Liberal Party: A.K.A. the Sort-of Democratic Party, meaning everyone gets to vote as long as they vote how Justin wants on abortion. There’s no box to click that lets you identify as middle class, but I’m sure they wouldn’t mind if you wrote that in. You can pay to the Victory Fund and/or get a “one-time membership purchase” for $10 a year for a max of five years. They want to know if you’re of aboriginal ancestry, and whether you want to join a senior’s, women’s or youth club. Accepts Visa, MasterCard, Amex and money via PayPal. The Bank of Canada’s “monetary medicine” is boosting the auto and housing sectors of the economy, based on numbers we’ve seen this week, with more to come today and tomorrow. Canadian auto sales released yesterday showed the best July results ever, and you can bet the Vancouver real estate board will report ever-higher prices later today, followed by the Toronto board tomorrow morning. “Interest-sensitive areas of Canada’s economy - namely, real estate and autos - are responding well to the monetary medicine,” Bank of Montreal senior economist Sal Guatieri said in a research note today. “Reported yesterday, new motor vehicle sales hit their highest July levels on record, modestly besting the prior year’s blowout figures,” he added. Indeed, several luxury brands “enjoyed significant growth” last month, said DesRosiers Automotive Consultants, noting the gains lead by Volvo, Acura and Lexus. Amount claimed by Apollo 11 astronaut Buzz Aldrin on his government travel voucher from Houston to Cape Kennedy to the moon to Hawaii and eventually back to Texas.